Judith takes her place among women who are remembered not just for their beauty, but for their ability to lead others in the way of understanding. This is important because beauty, as the “rising stairs” towards wisdom, may be our last hope out of the ever-pervasive technological and economical corner that we have trapped ourselves in—one that has put our communal, political, and environmental existence at risk. The continuing of a world amidst the threat of a certain conquering attitude is of no news to Judith and her people, and it is central to what the story as a whole means in our time. But in order to understand what exactly she means to us, perhaps we ought to intertwine Judith’s story with that of another who holds similar qualities, albeit in a very different time and place. For Diotima, the art of love, including such a love of the gods, “belongs to anyone who has given birth to true virtue and nourished it, and if any human being could become immortal, it would be he.”3 In Diotima’s story, physical beauty is the beginning of the long road of virtue—a road that is named the love (eros) of wisdom for its primary recognition that we do not yet know. And so we find here the eternal things hidden in Judith’s story: a recognition of not knowing as the road to understanding, a desire for piety that is fulfilled by following that recognition in the footsteps of beauty, and the intertwining of such a life with how the story is remembered and retold. We turn now to Judith. Her tale begins with a king who, having achieved success without the support he desired, seeks revenge. He sends his general, Holofernes, to travel the earth demolishing all that is sacred to other peoples, destroying the “local gods” and subsuming those of other languages and nationalities. When the Israelites hear this, they prepare themselves in the hills, closing off the mountain passages, and call out to God. They drape the altar itself in sackcloth. But, soon after, they move and plan too quickly, not giving understanding its due. Enter Judith, who begins by reprimanding the “teachers” of the town for their willingness to agree with the crowd in surrender to Holofernes if God remains silent within the days they have numbered. With this, Judith finds her life, once devoted to solitude and piety, pushed into the world where she must adorn herself in beauty. Unlike Diotima, who sees physical beauty as the beginning of the road of virtue, Judith’s story begins with virtue and descends to physical beauty. And while Judith is praised for her wisdom and eloquence,5 it is her beauty that conquers in the enemy’s camp as she sits with Holofernes, whom she praises for his cunning knowledge in battle. It is her beauty that ultimately disarms and takes his soul as captive.6 And, as Diotima might have foretold, in the face of such beauty even Holofernes, in all his methodical knowledge, is seized, if just for a moment, by the spirit of understanding. Mary Elliot is a Lonergan Graduate Fellow at Boston College and a research assistant at the Agora Institute for Civic Virtue and the Common Good. 1 Plato, Symposium, trans. Nehamas and Woodruff (Indianapolis: Hackett, 1989), 201D. 2 Plato, “Euthyphro,” in Five Dialogues, 2nd ed., trans. G. M. A. Grube (Indianapolis: Hackett, 2002), 4B. 4 Judith 8:13–14 (New Jerusalem Bible). 5 Among her own people, Uzziah and others praised her understanding: “Not that today is the first time your wisdom has been displayed” (8:29). And across the battle lines, Holofernes and all his adjudicates, too, praised her: “There is no woman like her from one end of the earth to the other, so lovely of face and so wise of speech!” (11:21). 6 “The heart of Holofernes was ravished at the sight; his very soul was stirred” (12:16). See also 16:2, 9. 7 Gray, J. G. “The Claims of Beauty,” The Virginia Quarterly Review 49, no. 3 (1973): 357–70, at 365. 8 Later Judith praises God as the one “who breaks battle-lines” through the concrete, camping in the middle of his people (16:2). 10 Gray, J. Glenn. “The Claims of Beauty,” 363, 365. 13 It is, after all, “not really we ourselves who understand: it is always a past that allows us to say, ‘I have understood.’” Gadamer, Hans-Georg. “On the Problem of Self-Understanding,” in Philosophical Hermeneutics, trans. David E. Linge (Berkeley: University of California Press, 1976), 58. The Apocryphal books of the Bible, which include the book of Judith, had a troubled history in the Protestant Reformation. Found in the Greek translation of the Hebrew Bible known as the Septuagint, they were not included in the Masoretic text, and the reformers of the sixteenth century debated their status in scripture. The church father Jerome had argued that the books of the Apocrypha did not belong to the canon of the Bible, but that they were profitable to read, a position adopted by most Protestant reformers. In the Luther Bible of 1534, which was the first complete German translation produced by the reformer, the books of the Apocrypha (including Judith) were placed between the testaments with the description that they were “useful and good to read.” Later, in Geneva, John Calvin would take the same position. Luther’s assessment of the book of Judith specifically was also more complex. In his 1534 preface he revealed a largely positive attitude towards the book. Although he doubted the historical veracity of the story of Judith, finding that its events and chronology did not square with other books of the Bible, notably Jeremiah and Ezra, there was much to be admired. He held up Judith, declaring that her story would have been of great value to the ancient people as instruction in virtue and godly living. Indeed, Luther felt that as allegory Judith was an excellent piece of Christian edification. In its struggle against Protestantism in the sixteenth century, the renewed Catholic Church appropriated valiant Judith, triumphant over unbelievers, as a significant tool of veneration and propaganda. The heroine of the Apocryphal book was presented in literature and paintings as the conqueror of heretics and as a symbol of Catholic resurgence. In the Palazzo Laternese in Rome, a series of frescoes of the Judith story was painted for Pope Sixtus V, who reigned from 1585–90.2 In twenty scenes, produced by the workshop of Giovanni Guerra and Cesare Nebbia, the story of Judith is told on a grand scale. The message of the art could not be more striking: church was restored and triumphant and the authority of the Tridentine papacy absolute. The execution of Holofernes was nothing less than the true Church dispatching its most reviled enemies. Cover page of Vulgate Bible from the time of Pope Sixtus V.
Catholic writers such as Robert Bellarmine robustly defended the place of the book of Judith in the canon of the Latin Bible known as the Vulgate. Much of his argument was directed against the views of Martin Luther, who, as we have just noted, doubted the place of the Book of Judith in scripture. Bellarmine searched out arguments to defend Judith, and much of his attention to historical context is expressed in the Lateran frescoes. Another key writer in the Catholic appropriation of Judith was Cesare Baronio, the great historian of the Catholic Reformation. Baronio identified the Judith story with papal authority by making the heroine a type for Peter, the first pope. As one historian recently commented, “Baronio’s reference reveals that Judith was more than a generic personification of the triumphant Church: she was fashioned as a pillar of the contentious doctrine of papal sovereignty itself. We find here yet another reason for the Catholic insistence on her canonicity.”3 The Catholic defense of the book’s canonicity fashioned a figure who embodied the triumph over infidels and heretics in a conflict that culminated in the battle between the Bethulians and Assyrians, and the victory of the former. The true Church likewise crushed both the Turks and the heretical followers of Luther and Calvin. Judith’s most singular role was as a type for Mary, a connection first made by the ancient fathers of the Church. Mary was at the center of a fierce struggle between Protestants and Catholics in the sixteenth century. One theme that united almost all Protestant reformers was the rejection of the intercessory powers of Mary, who by their reckoning was the model of humility and faithfulness, not the Queen of Heaven to whom men and women could pray. But Mary had been of great importance in the late-medieval church, and this relationship was continued and even enhanced in the Catholic Reformation. To counter Protestant arguments that the veneration of Mary was unscriptural, Catholic scholars turned to the book of Judith as providing a precursor. Judith’s genealogy in the book, which is the longest of any woman’s in the Hebrew Bible, confirmed Mary’s lineage from the house of David. Judith’s chastity and humility preceded that of Mary: Judith delivered the people by resisting Holofernes’ advances, and, although she was able to deceive him, she succumbed to his will before she ultimately killed him. Scholars have also noted that Judith’s frequent recourse to prayer would be reinforced in Mary, who intercedes for the faithful. Judith was interpreted as a model of the devout Christian life, one of prayer and virtuous action. Such was the connection made between the two women that passages from the book of Judith became part of the liturgies for Mary’s feast days. Perhaps most important are the words of Bethulian elder Ozias (Judith 13:23), who, when Judith returns from the Assyrian camp, declares, ”Blessed art thou, O daughter, by the Lord the most high God, above all women on earth.” This passage became of great significance to Tridentine Catholics, finding expression in the Ave Maria. Judith rose above the debate over her book’s canonicity to inspire, in different ways, both Catholics and Protestants. A native of Canada, Professor Bruce Gordon taught at the University of St. Andrews in Scotland, where he was professor of modern history and deputy director of the St. Andrews Reformation Studies Institute, before joining the Yale faculty in 2008. Gordon teaches and supervises graduate students in a broad range of medieval and early modern subjects and their resonances in contemporary historiography and society. In 2012 he received an honorary doctorate from the University of Zurich. 2 I recommend the essay by Elena Ciletti, “Judith as Imagery in Catholic Orthodoxy in Counter Reformation Italy,” in The Sword of Judith. Judith Studies across the Disciplines, ed. Kevin R. Brine, Elena Ciletti, and Henrike Lähnemann. (Cambridge: Open Book Publishers, 2010), 345–68. My view of Judith in Catholic reception is much indebted to Ciletti’s chapter. 3 Ciletti, “Judith as Imagery,” 351. Oratorio and opera grew up alongside one another, and, throughout the seventeenth and eighteenth centuries, the twin genres developed along fairly similar lines. Both forms have their origins in private societies of an intellectual character in the late sixteenth century. Opera emerged from the innovations of the Florentine Camerata, a humanistic society which met at the home of Giovanni de’ Bardi. The oratorio emerged in Rome, out of the Congregazione dell’Oratorio, an order of secular clergy founded by Filippo Neri in the 1550s and still active today (to avert confusion it is well to note that oratorio uncapitalized refers to the musical genre; an Oratorian is a member of Neri’s order; and an Oratory, in English, or Oratorio, capitalized in Italian, is a building used for meetings of the Congregazione). The Oratorians held evening meetings at which scripture was read and discussed, and communal devotional singing was supplemented with occasional dramatic renditions of scriptural stories given by visiting musicians and actors. Offering an atmosphere of intellectual openness and conviviality, the Oratorians attracted a substantial following, notably including Giovanni Pierluigi da Palestrina, who may have written music for Neri’s gatherings. Over half of a century, musical dialogues based on scripture evolved into the historia, drama rhythmometrum, and cantata,1 loosely defined musico-dramatic forms which are substantially identical to one another and to the oratorio in musica. The oratorio thrived in Venice from 16672 until about 1700. From 1700 to about 1740, although oratorio performances continued, the number of new compositions dropped off precipitously. Domenico Freschi’s Oratorio della Giuditta is one of the exceedingly few surviving examples of oratorio from the vicinity of Venice dating from that period. It was presented in Vicenza, the small city thirty-eight miles outside of Venice where Freschi was maestro di capella, at the cathedral, in 1705. It was also performed in Vienna. While the exact date of this performance is unknown, it is presumed to postdate the one in Vicenza due to the fact that the music has survived in a manuscript score in the Austrian State Library. By 1705, Freschi (1634–1710), had held his position in Vicenza for nearly fifty years, having been appointed in 1656 at the age of twenty-two. He was also a priest, and was ordained at Vicenza in 1650. Freschi’s duties included supplying music for the Mass and for the principal feast days in the Vicenza cathedral and the other principal churches in the town. Outside of his responsibilities in Vicenza, in the 1670s and 1680s, Freschi composed at least eleven operas for production in Venice. Despite the Biblical, or more properly deuterocanonical, subject matter of Giuditta, it is far more closely linked to Freschi’s work in the domain of opera than to his liturgical music. His surviving music for worship is simple in style, and shows little interest in dramatic effect; judging from the scant music which is available today, he appears to have made a sharp distinction between theatrical and liturgical music. Giuditta displays well-defined characters, some vivid text-painting and madrigalisms (the illustrative devices typical of Renaissance madrigals and widely used through the Baroque period), and an abundance of recitative. It is not clear where Freschi’s oratorios were performed. The Congregazione dell’Oratorio did not found its Oratory in Vicenza until 1720. Given the ambiguity of the precise dates and circumstances of the first performances of Giuditta, any discussion of its intended meaning or of any potential allegorical intent must remain speculative. The performance in Vienna around 1705 is too suggestive to pass over, nevertheless. In 1704, four years into the War of the Spanish Succession, Vienna was threatened simultaneously by Bavarian armies from the North and French armies from the south. Its fall, which appeared inevitable, would likely have precipitated the collapse of the Grand Alliance. A dispute arose between British and Dutch military leaders as to how to respond; the Duke of Marlborough argued for sending troops to counter the Bavarian threat, but the Dutch demurred. Marlborough, convinced that further inaction could mean the end of the Alliance, pretended to cede to the Dutch, sending his troops at first only as far as Koblenz, where the Rhine and Moselle rivers intersect, on the pretext of a northerly campaign along the Moselle. From there, he redirected them into modern-day Bavaria, where they met and defeated the Franco-Bavarian forces at Blindheim (known as the Battle of Blenheim) on August 13, 1704, saving Vienna and turning the tide of the war—though ten more years of strife still lay ahead. A map of the Battle of Blenheim from The Department of History, US Military Academy. For a Viennese audience in 1705, Judith’s unilateral assault on the Assyrian general Holofernes, rescuing Israel from a threat her countrymen declined to face, must have registered as a quite familiar story. Paolo Bernardini argues that one of the defining features of Judith is her acting “on her own . . . in contradiction to the policy originally set by the leaders of her people.”3 This quality of individualism and salvific power outside of the bounds of established, masculine power is consonant with Judith’s role as an ur-heroine, one of the oldest and most potent symbols of feminine strength. The secretive British gambit which led to the Battle of Blenheim, in contravention of the Alliance’s collective decision, conforms neatly to the Judith mold. 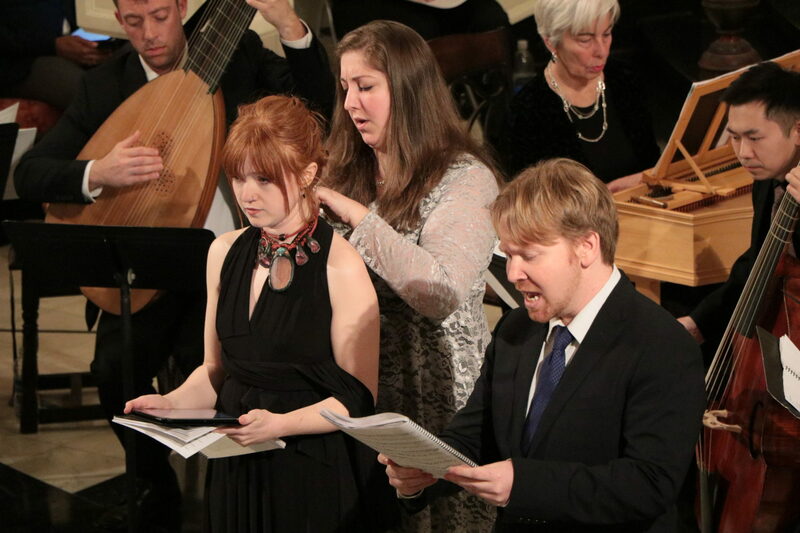 The composers and poets who created the first operas in the first years of the seventeenth century were driven by a desire to harness the potent emotional impact which ancient writers attributed to music. Knowing that declamation and song were closely linked for the Greeks, the Florentines sought to unite their contemporary music and poetry into a single art, and they developed the techniques of monody (music for one melodic line with a rhythmically independent bass line accompaniment), basso continuo (semi-improvised chordal accompaniment guided by a written-out bass line), and recitative, which are the essential ingredients not only of opera, but of the stil moderno which today we call Baroque. Recitative, especially, was at the heart of the aesthetic of both early oratorio and early opera: the mimetic imitation of the actual rhythms of human speech gave this nuove musiche an emotional directness which both evoked the ideals of the ancients and spoke directly to contemporary audiences. By the last years of the seventeenth century, however, opera and oratorio alike were tending increasingly toward melodrama and towards an emphasis on virtuoso display by singers. This resulted in exaggerated and implausible plotlines in the libretti, and a marked decline in the use of recitative in favor of increasingly extended arias, the favored vehicle of the celebrity singer. A strong exception to this trend was Venetian oratorio composers, among them Freschi. Contrary to the prevailing manner of the time, Freschi and his colleagues continued to write oratorios using a small number of realistic characters, singing a great deal of recitative. It is perhaps this conservative strain in Freschi’s oratorio style which allowed him to collaborate successfully with the librettist of Giuditta, Abate Francesco Silvani. Silvani (1660–1744) was a Venetian monk and poet some twenty-five years Freschi’s junior. Silvani produced libretti for opera which found favor with the most celebrated composers of the 18th century, among them Ariosti, Vivaldi, and Handel. Heavily influenced by the leading reformer of opera, Apostolo Zeno, Silvani’s works generally observed the Aristotelian unities of action, time, and place, and are heavily weighted towards recitative rather than aria.4 These qualities had not lost favor with Freschi to begin with, so the younger man’s reforming spirit must have been consonant with the elder’s held-over preferences from the prior century. Jude Ziliak is a violinist specialized in historical performance practices. Widely active as a chamber musician in repertories from the Renaissance to the present, he is a member of the American Bach Soloists in San Francisco and Sonnambula and the Clarion Society in New York. A graduate of the Juilliard School, he teaches at the Special Music School, New York’s public school for musically gifted children. He writes program notes for such organizations as Lincoln Center, Music Before 1800, and the Portland Baroque Orchestra. 1 Lorenzo Bianconi, trans. David Bryant, Music in the Seventeenth Century. (Cambridge: University of Cambridge Press, 1987), 124. 2 George Buelow, A History of Baroque Music. (Bloomington, IN: Indiana University Press, 2004), 97. 3 Paolo Bernardini, Episodes in Early Modern and Modern Christian-Jewish Relations: Diasporas, Dogmas, Differences. (Newcastle upon Tyne: Cambridge Scholars Publishing, 2016), 145–59. 4 Harris S. Saunders. “Silvani, Francesco.” Grove Music Online. Oxford Music Online. Oxford University Press. Web. 25 Aug. 2017. <http://0-www.oxfordmusiconline.com.library.juiliard.edu /subscriber/article/grove/music/25789>.